With the flick of a wrist, one room becomes two with the Bronson Room Divider. Featuring a rotating, thin-panel mounting system equipped with surrounding ambient light fixture, this Contempo home amenity provides abundant storage space and a swiveling centerpiece to maximize any room's potential. 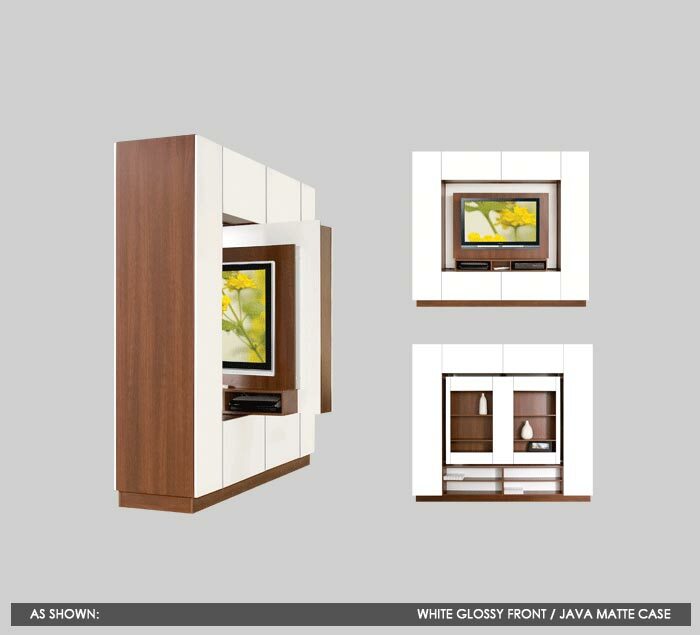 The center TV panel comfortably houses sleek, flat-screen televisions. Fill the Bronson's component shelf and utility drawers beneath with your Blu-Ray player, video games, cable boxes, or any other necessities for your home theater. We'll leave the panel's opposite side free for you to decorate according to your home preferences. In-home delivery and installation are available upon request. Our trained, in-house professionals will unwrap and install your purchase as directed by you. Packing materials will then be removed and recycled at our factory. All you need to do is sit back and enjoy the new view. Two storage drawers measuring 14" H x 29.5" W x 15.75"